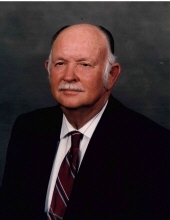 Loyd Harley “L.H.” Bland, passed away Monday, February 4, 2019 at Memorial Health University Medical Center in Savannah after a short illness. He was born October 13, 1932 to Loyd Remer and Ezzie Mae Jones Bland and lived here all of his life. L.H. was a farmer and a steward of the land he loved so much. He loved the outdoors being with his wife, children and grandchildren. He was a deacon and member of Watermelon Creek Baptist Church. He is preceded in death by his parents, brother, Floyd Bland, brother in-laws, Grady Brannen and Theron Brannen. Visitation will begin at 5:00 pm, Friday, February 8, 2019 at Brannen-Kennedy Funeral Home. Funeral Services will be held 11:00 am, Saturday, February 9, 2019 at Watermelon Creek Baptist Church. Burial will follow in Watermelon Creek Baptist Church Cemetery. To send flowers or a remembrance gift to the family of Loyd Harley "L.H. Bland, please visit our Tribute Store. "Email Address" would like to share the life celebration of Loyd Harley "L.H. Bland. Click on the "link" to go to share a favorite memory or leave a condolence message for the family.